All breweries require a supply of carbon dioxide for use as a motor gas for transporting liquids from one location to another, for de-aerating water, other process liquids and empty tanks and for adjusting carbonation levels in beers. This requirement may be satisfied by recovering the carbon dioxide evolved during fermentation. Whether or not this is actually done is dependent on economic considerations. Thus, the cost of purchase of carbon dioxide from an external source must be weighed against the capital expenditure of fitting recovery plant and the revenue costs attracted by its operation. However, current concerns with respect to the generation of greenhouse gases suggest that it should not be simply an economic question. Thus, it is now important to consider the ecological price of uncontrolled emission of gases into the atmosphere. Theoretically, the yield of carbon dioxide in weight terms is roughly equal to half the weight of sugar fermented. Not all of this gas can be collected since some moves forward in solution in the green beer and another portion is lost in early fermentation whilst air is purged out of the fermenter head space. Williams (1990) described installation and operation of carbon dioxide recovery plant at the Charles Wells Brewery in the UK. With an estimated brewing volume of 650 000 hi per annum it was estimated that 2400 tonnes of carbon dioxide could be recovered (3.7 kg hi *). Recovery of carbon dioxide from fermenters involves a combination of purification, drying, compression, cooling and liquefaction. The purification steps must remove any potential unwholesome flavour taint and most importantly ensure that oxygen levels are reduced to a minimum. This is essential to avoid the possibility of introducing oxygen to beer when recovered carbon dioxide is used as a process gas. Haffmans (1996) provided a specification for recovered carbon dioxide (Table 6.7). Table 6.7 Specification for recovered carbon dioxide (from Haffmans, 1996). A schematic of a typical carbon dioxide recovery plant is shown in Fig. 6.36. The initial gas flow through the bubble pot is vented to atmosphere to ensure that no air is allowed to enter the plant. This cut-off may be automated using an in-line sensor, which measures levels of oxygen in the gas stream. Carbon dioxide is recovered from fermenter via a fob trap and fob detector. Both of these ensure that no liquid foam goes forward into the recovery plant with the gas stream. 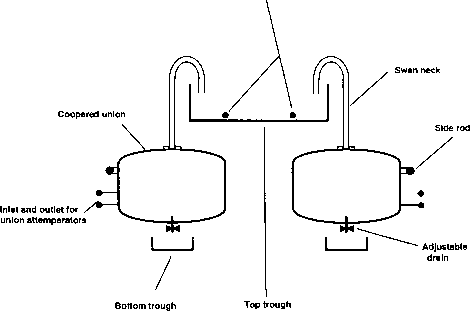 The latter is collected into a balloon which acts as a buffer tank to compensate for irregular flow rates. 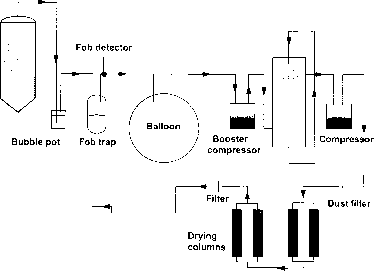 When the balloon is full, forward flow is started automatically and the pressure is increased using a preliminary booster compressor. In the gas scrubber, water-soluble impurities such as ethanol and acetaldehyde are removed by a counter-current flow of water. The pressure is further increased by a two-stage oil-free compressor and the gas stream is directed towards columns containing activated charcoal. These also remove ethanol but are particularly aimed at eliminating volatile components such as beer esters, dimethyl sulphide and hydrogen sulphide. The charcoal columns are used in pairs so that one may be used whilst the other is regenerated. This must be performed periodically by treating the contaminated carbon with a flow of steam followed by drying. Fig. 6.36 Carbon dioxide recovery, liquefaction and gas supply plant. The gas stream is then dried by passage through another column containing moisture retaining materials such as activated alumina or proprietary molecular sieving preparations. Parallel drying columns are also used to allow simultaneous use and re-generation. Moisture must be removed at this stage to prevent ice formation in the liquefaction plant. Filters of various types are placed in the gas stream to remove particulate materials. Liquefaction is achieved using a combination of low temperature and pressure, typically 17.5 bar g and — 24°C. The liquefaction process assists with purification in that non-condensable oxygen and nitrogen are removed. However, the oxygen concentration at the point of delivery must be less than 0.2% v/v or liquefaction is not possible. Bulk liquid carbon dioxide is stored in an insulated tank. Supply of the gas to the brewery is via an evaporator in which the liquid carbon dioxide is vaporised by heating with steam. At times of high demand, the liquefaction step may be by-passed and the purified carbon dioxide gas used directly. How is carbondioxide removed in beer? Why co2 recovery process in breweries?